Many loved songs out there only use three chords. This lessons will give you some ideas for writing your own three chord guitar progressions, making use of some of the chords we've learned in the main guitar chords section (although I will provide the necessary diagrams throughout the lesson). As well as the simplicity of writing songs based on just a few chords, it also encourages you to break down concepts of resolution and harmony through chord changes. So while your finished song may use more than three chords, breaking it down this way offers you a more manageable way to explore the theory behind what makes a chord progression flow and "work". Throughout the chord progressions section, you can learn about the diatonic chord scale. I IV V (1 4 5) represents three chords (the 1st, 4th and 5th) taken from this seven chord scale. These three chords are the foundation of blues and many popular songs. Making the V chord a dominant 7th chord (V7) enhances that tension-resolution between V and I (1 being the tonic or "home"). 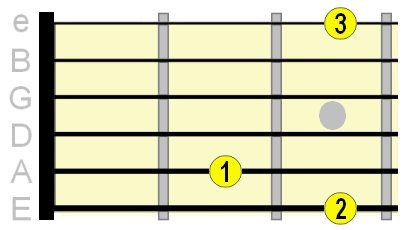 The 5 chord also works well as a suspended (or "sus") chord, e.g. Asus4. So even with just three chords there are many combinations to experiment with! The table below shows you this 1 4 5 relationship in other keys. 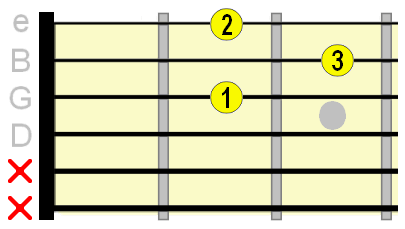 Note that these are all major chords, but there are different types of major chord you can build on these root positions. Experiment with building different chords you know on these positions. Of course, you could also just use power chords on these positions if you wanted more of a minimalist, rock sound. As well as 1 4 5, there are other natural three chord guitar sequences you can pull from the diatonic scale. The most common way to use this combo is in the sequence of 2 5 1. This is a standard "turnaround" sequence used in a lot of jazz music. The emphasis is on resolving to that major tonic (1). Even though these are still major key progressions (due to the major tonic), the minor ii chord gives it a more sombre feel. I don't want to delve too much into this concept now as it's already covered in depth in the main section. But the idea is to take these chord progressions and experiment with changing the major chords to minor and minor to major. A typical example there of how the major IV chord becomes a minor iv chord. The minor ii Dm becomes a major II D7. Of course, you don't have to stick within this diatonic scale. Some great songs have been written by playing chords in random positions. However, I plan to upload lessons that will help make this "outside" venturing more thoughtful.